On Wednesday, Tipton County Animal Control received a phone call that a dog managed to get into a private home to escape the brutal cold. When the ACO arrived on the scene, he was horrified to see small Red Heeler was in agony from one of the most gruesome injuries he had witnessed in his career. 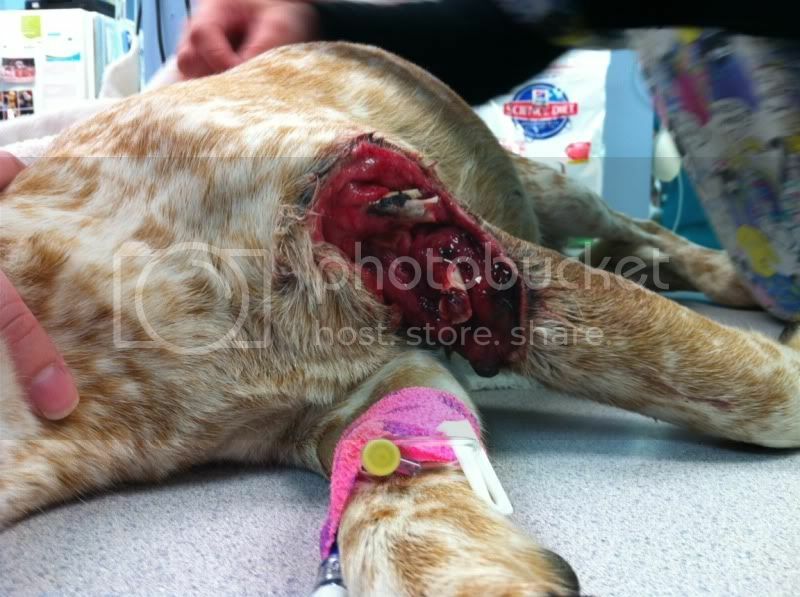 The property owners claimed that the dog had “just showed up” at the property two days before and they had not noticed her gaping wounds. Note, images of Winnie’s wounds are graphic and can only be access by following the links below. The ACO called PAWS knowing that the pup needed immediate medical attention and the shelter’s budget did not allot for veterinary bills. In a mere 20 minutes, the dog was named Winnie and volunteers had organized a ride for her to get to an emergency animal hospital. Immediately after her amputation surgery..
Winnie’s condition was touch and go the first night. She was in shock from the significant blood loss and developing a life threatening infection because there was bone and muscle exposure at the wound site. The vets quickly assessed that there was no chance Winnie would be able to keep her leg- but they were also concerned that her pulse was very high and her blood levels were very low. 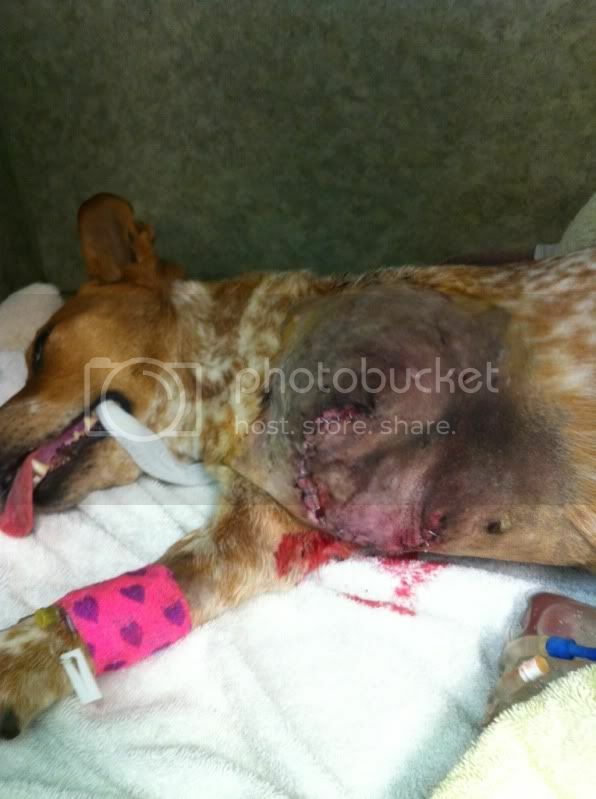 She was started on high potency antibiotics, and given IV fluids and supportive care. Winnie was transferred first thing in the morning to the Shelby Center in Memphis, TN where Dr. Morris cleared his morning schedule to see her. He quickly agreed that she needed an emergency amputation and was operating on her within the hour. Thankfully, the procedure went well and Winnie has an unbelievable will to survive. The piece of this story is what really churns our stomach is how Winnie was injured. When we first posted about Winnie on our facebook site, a woman made multiple posts stating that she was the person who first sighted Winnie on her property and called Tipton County to have her removed from her home. She started weaving a web of lies about not noticing Winnie’s wounds and then gushing about how concerned she was and how she wanted to adopt her when she recovered. One of our volunteers happened to click the woman’s profile and was shocked to see that this same woman had posted three days earlier that a dog outside was “running its mouth” (ie barking) and so her husband “shot at it… LOL.” Never, in all our investigations of animal cruelty have we had a suspect freely admit on a public forum to the crime. Winnie is getting around just great! The case is under investigation and the facebook postings as well as the fragments of the shotgun recovered from Winnie’s wound will be used as evidence to prosecute. We remain flabbergasted that someone could “LOL” (laugh out loud) about such a disgusting act of violence and then proceed to offer to adopt the animal. This is a sad reminder that we have a lot of work left to do to educate the public about the appropriate treatment of animals. Sadly, we also discovered the Winnie is heartworm positive and had multiple GI parasites. The abuse and neglect of this special creature occurred long before her gunshot wound. Amazingly, she holds absolutely no grudges against humanity and loves nothing more than snuggling with her foster Mom. Winnie has a long road ahead for her recovery, but PAWS will be with her every step of the way!